At the Kühlungsborn Yacht Harbour, metal plates coated with the paint formulations developed by the Fraunhofer IMWS show no fouling even after a 7-month test phase on the Baltic Sea. The Fraunhofer Institute for the Microstructure of Materials and Systems IMWS in Halle(Saale) is carrying out research pointing the way to a sustainable, resource-saving and environmentally friendly way of life. Together with partners from industry, it is developing, for example, surface coatings that prevent the process of biofouling. This summer, because of persistent drought, people in some places were advised to be sparing in their use of water. Something that occurs only very rarely in Germany, and is limited to particular areas, is a constant problem in other countries without freshwater springs. “Drinking water, as a globally precious commodity, should be included in the efficient and sustainable use of limited resources”, says Project Manager Ulrike Hirsch of the Fraunhofer Institute for the Microstructure of Materials and Systems IMWS in Halle. In 2017, its team received the Hugo-Junkers Innovation Award of the State of Saxony-Anhalt for its research into more efficient methods of producing drinking water. It developed coated components for membrane modules by means of which seawater and brackish water are transformed into drinking water through the principle of reverse osmosis. Its industrial cooperation partner is IAB Ionenaustauscher GmbH from Bitterfeld in Saxony-Anhalt. This 100-percent subsidiary of LANXESS AG manufactures membrane filtration elements for water processing, among other things. It is not the first time that the teams from Halle and Bitterfeld have worked together. “When it comes to applied research in the field of material efficiency, the Fraunhofer Institute is a capable driving force and problem-solver for industry”, emphasises Carsten Schellenberg. He is the Managing Director of IAB Ionenaustauscher GmbH and is responsible for the research and development work at the Bitterfeld site. Companies, especially from the fields of medical technology, pharmacy, biotechnology, and plastics processing, seek cooperation with Fraunhofer IMWS in the area of surface modification. Its core competences lie in material development, among other things. The common objective is the development of materials viable for the future, which are sustainable and environmentally friendly, and which are conducive to the responsible and efficient handling of limited raw materials. Experts from IAB and Fraunhofer IMWS are currently carrying out research together in the project “Innovative Membrane Spacer” in the optimising of modules for the processing of brackish water and seawater. “Membrane spacers are the spacers between the membranes that form the flow paths for water”, explains Magdalena Jabłońska, scientific employee at the Fraunhofer IMWS. These spacers are, however, also very prone to the build-up of suspended matter, salt crystals, and micro-organisms, she says. So-called biofouling, she continues, leads to blockages and a reduction in performance, up to the failure of membrane modules. The research partners are now developing hydrogel-type coatings for the surfaces of the spacers. Like a barrier, they are intended to prevent the adhesion of suspended materials and micro-organisms. 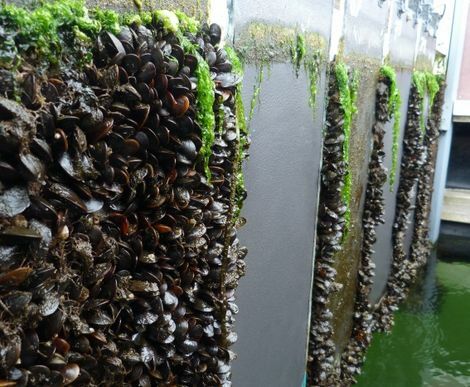 “If the biofouling process is slowed down or stopped, there is less material damage, slighter wear on the modules, and a lower maintenance requirement. This saves energy and costs”, says Magdalena Jabłońska. The findings gained in the framework of the joint project are to be incorporated into industrial processes at the Bitterfeld site of LANXESS. Biofouling is not only a problem with water filtration modules. The bases of offshore wind turbines or drilling platforms, and especially ships’ hulls, are also subjected to the growth of biofilm. The thick crust of micro-organisms, algae, mussels, and barnacles attacks the concrete foundations and significantly increases the ships’ fuel consumption. At the Fraunhofer IMWS in Halle there is a facility for the optimisation of special surface paints intended to prevent this biofouling. Partners in this project are the Institute for Plastic Technology and Recycling IKTR, the Society for the Promotion of Medical, Biological and Environmental Technologies GMBU Halle, bioplan GmbH, NTC NanoTechCoatings GmbH, and Schiffswerft Barth. “Previous anti-fouling paints”, says Project Manager Uwe Spohn, “have often contained poisonous substances that dissolve in water and are harmful for sea-dwellers. At our facility we are optimising a new generation of paints that works entirely without poisonous additive substances.” The ingenious thing about these surface coatings is their electrical conductivity. The project manager explains: “The paint system consists of several layers through which a direct current of a few milliamperes per square centimetre flows. The outer layer acts as an anode at which oxygen forms. The pH value sinks in this acidic environment. After pole reversal of the current flow, the outer layer of paint becomes a cathode at which hydrogen occurs, forming an alkaline milieu. The pH-value rises. Regular changes at certain time intervals subject the micro-organisms to pH-stress that makes it more difficult for them to settle.” Or, to put it another way: The ship steel remains free of vegetation, preventing the ship gaining weight on the high seas. This allows the avoidance of increased fuel consumption, additional pollutant emissions, longer journey times, decreased manoeuvrability, more frequent ship maintenance, and not least of all increased costs. This electrically conductive anti-fouling paint system has already proved its stability in a long-term test in the Baltic Sea. An initial ship trial has also already been a success. The project partners are now optimising the technology so that entire ships can be coated with the paint in shipyards.